1 Sauté your garlic in a pan, add kang kong and fish cake. 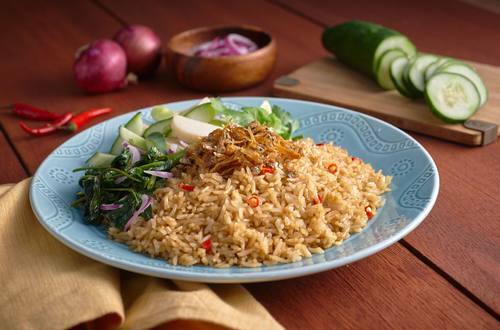 2 Once kang kong has softened, add your rice and continue to mix. Add your Knorr SavorRich Chicken Liquid Seasoning and chopped Thai chilies. Taste and add more chicken seasoning mix if needed. 3 Once fried rice is done, turn off the heat and add your red onions and white pepper. Mix and serve. 4 Serve with fried dilis on the side and garnish with sliced cucumbers and cilantro.